The Moti-Start Portable Supportive Seat is a pediatric, locally size adjustable supportive chair. 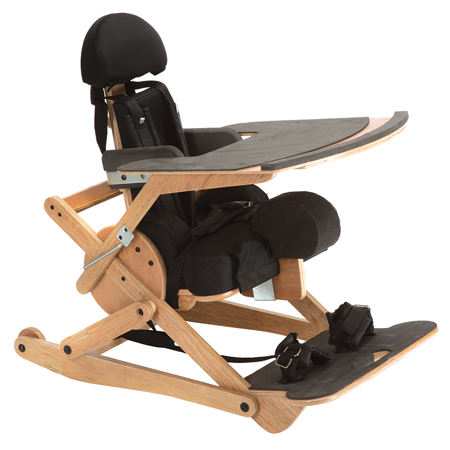 It is intended for use by infants who need extra postural support. It comes semi-assembled and is easy to transport and has many features such as an adjustable tray and headrest, and a tilt-in-space seat. It has a plywood frame, with durable upholstery and adjustable postural support components, including eight daily adjustable tilt positions. The product is designed for use on the floor but can be placed on a higher surface if the surface is large and stable enough to be safe. The component parts are easy to replace, maintain, repair or customize. Contoured headrest with removable, washable cover.